Iran was apart of Hindu Empire during the Vedic Period. This continued to be so till Vikramaditya’s period. 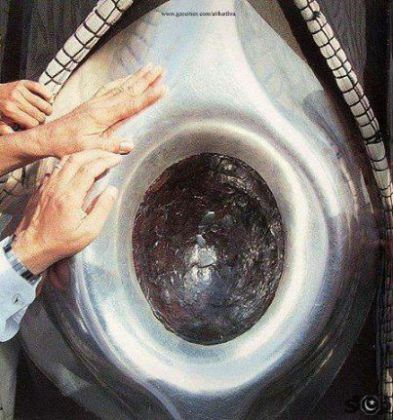 The customs and cultural behaviour of the Zoroastrians indicate the Vedic roots of Zoroastrianism. A treaty signed by the Hittites and Mitannis dating to the fourteenth century BC calls upon Indara/Indra, Mitras(il)/Mitra, Nasatianna/Nasatya and Uruvanass(il)/Varuna, all known to Rig-Veda and Avesta. Hittites and Mitannis were from North Syria. I had posted articles about the Vedic /Tamil origin of these people. Though there are similarities the roles of the Devas seem to have been reversed. Indra and the devas are demonic in Avesta,and Ahura/asura is considered the highest deity. VHP starts new campaign to end evils of caste bias, untouchability, discrimination to form Resurgent Hindu Society based on Social Equality. 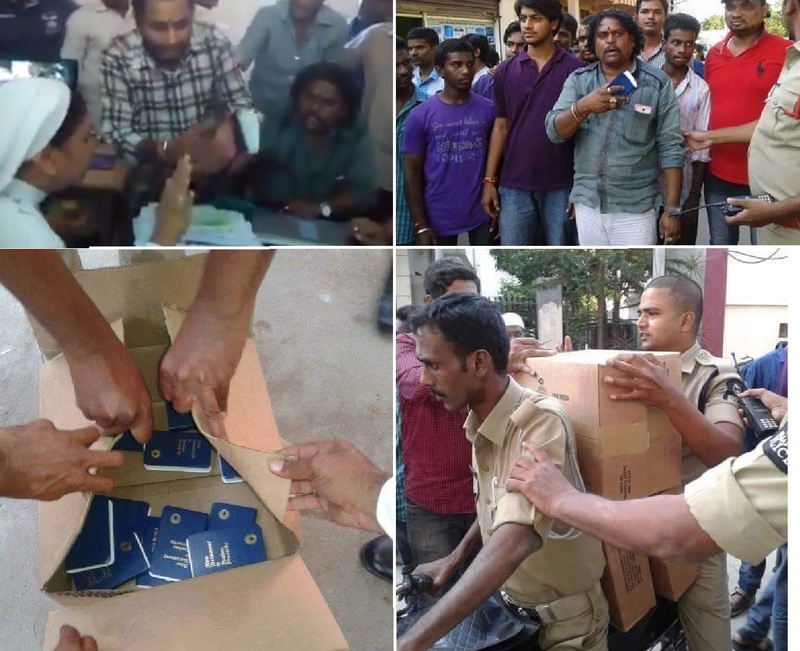 Hindu Vahini Volunteers protested Bible distribution to Hindu students, seized 400 Bibles and stopped Conversion ploy at St. Pious Girls High School, Hyderabad. HENB | Hederabad | March 14, 2015:: On 13 March, 4 Cartoons (100 in a pack. Total 400) of Bibles recovered from Principal’s room at St. Pious Girls High School (Ramnagar, Musheerabad, Hyderabad). Hindu Existence Forum had the tip off of this evangelical programme being made stealthily. Some of the Hindu Guardians were repeatedly commenting in Hindu Existence. After contacting Hindu Vahini Karyakartas (Volunteers) in Hyderabad, they took the resolution to crack the Conversion and Bible propagation conspiracy being held in Christian Schools. In a speedy operation they thundered over the premises of St. Pious Girls High School and unearthed the evangelical menace in Educational Institute run by the Christian Missionary. Twin Taliban blasts in Pakistan churches kill 15, wound 78 in Lahore. Hindus-Jews-Christians must unite to fight Radical Islam. HINDU EXISTENCE FORUM CONDEMNS TWIN BLASTS IN PAKISTAN CHURCHES IN SUNDAY SERVICE BY DEADLY TALIBANS. UGLY FACE OF RADICAL ISLAM EXPOSED AGAIN. EVEN THEN INDIAN CHRISTIANS LIKE TO SHAKE HANDS WITH RADICAL MUSLIMS TO STAND AGAINST HINDUS. HINDU-JEWS-CHRISTIANS MUST UNITE TO FIGHT RADICAL ISLAM FOR THE EXISTENCE OF CIVILIZATION!!!! 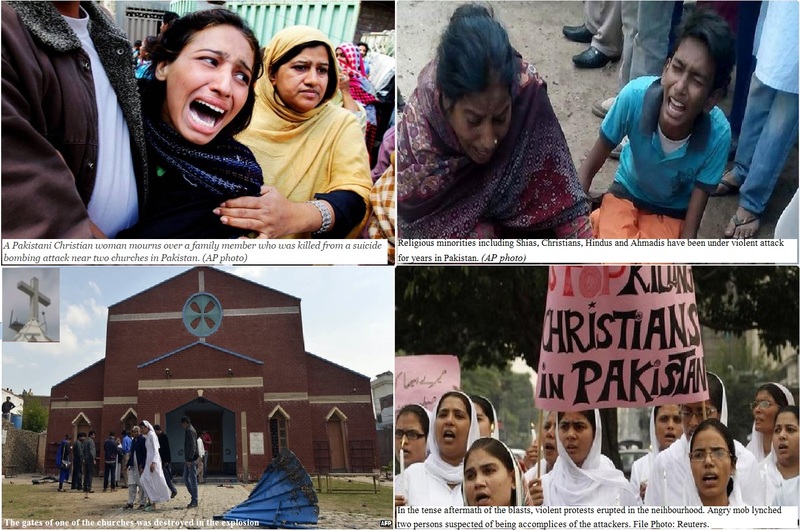 Omer Farooq Khan | TNN | Islamabad | Mar 15, 2015:: In the latest attack on religious minorities in Pakistan, twin Taliban suicide bombers blew themselves up at two Christian churches during Sunday mass in the country’s eastern city of Lahore, leaving at least 15 persons dead and more than 70 injured. The blasts sparked mob violence in the area in which two other suspected militants were killed and later their bodies were set on fire.